One thing that I have found most annoying about the movie Avatar is the chorus of praise for its "scientific accuracy." I don't know of any movie short of Star Trek that has tried so hard to convince its fans that it's based on real science, and fallen so short. So I thought it would be useful to just make an archive showing that the movie is not science-fiction; it's science mixed with fantasy. I know I promised this week to cover the moon of Pandora, but it's taking longer than I thought since astronomy isn't my specialty, and I want to get it right. So instead, we'll be looking at another famous aspect of Avatar, creatures with six legs. Most of the dominant lifeforms on Pandora have six limbs, making them what's known as hexapoda (Greek for "six legs"). 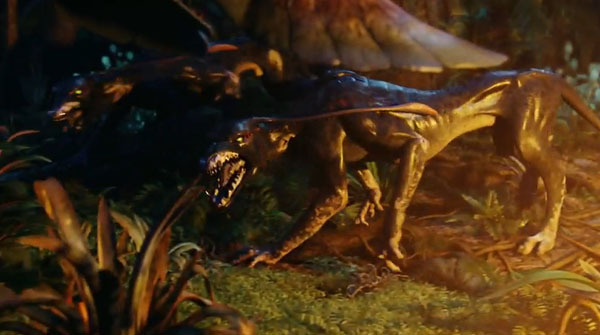 Some hexapods in the movie are a horse-like creature called the Direhorse, a panther-like creature called a Viperwolf, and a pterodactyl-like creature called a Mountain Banshee. All of them have six limbs. On Earth, most creatures are tetrapods, meaning they have four limbs. That includes everything from dogs to horses to humans. The only creatures that have six limbs are insects. There's a reason for that; four is a good number of limbs. Not too many, not too few. While one could argue that having four arms would be useful, it's not really necessary. Even if you needed or could use another set of hands, primates solved this problem by having opposable toes on their feet, turning them into a second pair of hands. Adding more limbs would just require more brain-power to control them, and would require a major change in configuration that would mean that it would have to have some benefit. While no one really knows exactly why insects have six limbs, we do know that it's an advantage to them as opposed to other animals. When a creature runs on two or four legs, only one or two feet remain in contact with the ground at all times. When a six-limbed insect runs on a surface, three limbs usually remain in contact with the ground at all times. For a wall-crawling creature like a fly or a spider, this is an advantage because it means greater stability when clinging to a vertical surface or upside-down. That's not an advantage that other animals need walking upright on a flat surface. In many ways, six legs would hinder normal creatures. For example, insects on Earth that have six legs have them splayed out from the body so they don't get in each other's way. In Avatar, all the creatures have their six legs in line with their bodies, which would cause them to bump into or get tangled up together easily. It seems like the designers knew this, so they tried to adjust for it. Let's look at the Direhorse, for example. It was a speedy creature in the movie, but take note that they animated the Direhorse to run just like our four-limbed horses with the front two legs moving together and the rear two legs moving in the opposite direction. This would be a recipe for disaster, since the forelegs would only work if they were exactly in sync. The slightest misstep on any of the four forelegs would cause the creature to trip on its own limbs and fall. The Direhorses should run more like cockroaches, alternating three legs at a time. That would actually cause them to run slower than Earth horses, which goes back to our original point…they would be better off with four legs. Then there's the obvious fact that the Na'vi have only four limbs; two arms, two legs. But that's for another post. What do you think about Avatar's six legged beasts? As a viewer I value coolness and style over accuracy - I expect to suspend my disbelief a little so I only need things to be plausible enough for me to follow the plot. Pandoran creatures definitely look alien (apart from the horse which is too familiar) and the similarities in numbers of legs and eyes are short-hand - they give the impression of common evolutionary ancestors and a wider ecosystem. They also give the film a distinctive style and set it apart from the aliens of other films. I think this wouldn't be an issue at all if the producers had left well alone and hadn't made such a fuss about the scientific accuracy. They end up looking silly (pretty much any producer who takes his own work too seriously can end up looking silly) when, accuracy aside, the creatures are definitely one of the best aspects of the film. I agree. The parade of biologists and astronomers and physicists that they ran by the media was really a smokescreen. The truth is that they did try really hard to be accurate, but when it came to realism vs some cool effect they wanted, they went with the effect. Somebody once said a bad explanation is worse than no explanation. True 'dat. Okay...had to go through the post a few times to find what you were talking about. Didn't know I'd left that in. Typo. I took out the word "certain," so now it's accurate. Thanks for pointing that out. Now I assume you'll be going to James Cameron's website and fact-checking all his scientific accuracies in the movie "Avatar." To your first point, I'm aware that species could have evolved with six limbs. The fact that almost everything on Na'vi has six limbs implies a common ancestor, a six-limbed lungfish as you will. But the question is why a lungfish would develop with six limbs in the first place. Evolution isn't supposed to function entirely at random - it's supposed to be passing on the best and most dominant traits to descendants. For that matter, they might as well have a billion legs. The point is, are six limbs an advantage or disadvantage that later species benefit from. For your second point, it's not a lack of imagination. It goes back to the question of why they would need them. If you look at the six-limbed creatures in the movie, you'll see that their extra limbs aren't really useful at all. Look at the example I raised of the Direhorse. For your point, the birds in "Avatar" don't have extra arms for manipulating. They have an extra set of wings. Earth's birds fly extremely well with two wings. The Na'vi birds had to alternate flapping their four wings, raising the potential of getting their wings out of sync, tangled, and falling from the sky. Actually most of your post is completely wrong. The fact that land animals have four legs has absolutely nothing to do with how stable or efficient they are. The four limb plan developed in lung-fishes!! Because of the way evolution works in small steps, thats what land animals were stuck with. If the first fishes to develop adaptations to drying out had six finned layouts or three finned layouts (entirely possible), modern land animals might look completely different. Now if the first crawling vertebrates had six legs and then developed into four legged ones for whatever reasons, then you'd have ground for your argument. Also, your being unable to see advantages to six limb configurations only reflects a lack of imagination. Look at octopuses, they are making perfectly good efficiency tradeoffs for multiple limbs. It wouldnt be much harder for example to imagine the efficiency gains that flying animals would have with additional limbs, in fact one could argue all modern birds are terribly hindered by lack of an additional pair of limbs which might have allowed them to develop manipulative arms and a much advanced culture with artifacts, civilization.. you get the idea. I think I saw a similar concept in one of those science-fiction shows in National Geographic, where they theorize how alien planets, together with its flora and fauna, would be like (floating whales, giant mushrooms etc). They also pointed this thing about medium to large size animals would only be burdened if they have 6 legs. Nevertheless, Avatar was a fun and worthwhile movie to watch. It's probably 2010's top priority among movies to watch from that year! I love it so much I streamed it for free online! the six limbs seem to have come from Allen Dean Fosters Midworld, as do much of the alien-scapes. in fact, much of the plot seemed to come from Midworld. I was very dissapointed that the Na'vi only had four limbs, since the six limb blueprint is very obviously pointed out. Again, Midworld, in that the humanoids in Midworld were actually highly adapted humans. I had no idea. After reading a summary of Midworld I have to say you are 100% right. The plot is almost identical. A hexapod land animal would probably move in a 2/1 2/1 fashion. ( Two front and opposite single rear). Regarding loss of synchronization, if the hexapod animal was viable with six legs, then mutagenesis principle would say that they would have the needed synchronization. (What human hasn't tripped on occasion?) Furthermore, the above gait would allow the creature to not only move faster than a four legged animal, it would have more stability and muscular strength. I kind of address your points in my post. To see how a six legged creature would run, look at existing species like cockroaches. There isn't a six legged creature known that runs the way you describe. As for speed, having extra legs wouldn't make the creature faster. When running, you want as few legs hitting the ground as possible, since every foot that touches the ground slows you down. I don't think you're presenting a very convincing argument here. All of your reasoning about four vs six legs only concerns walking animals, but in truth our basic blueprints were determined by our fishy ancestors having two pairs of fins long before the first proto-amphibian crawled to dry land. And none of your hindrances apply to swimmers. If the first land vertebrates on Earth had been hexapods and had lost the extra pair later because four legs was somehow inherently superior, you'd have a point. And you're also only looking at runners, six limbs could very well have significant advantages in some forms, for example slower animals with increased stability, or centauroid types (think vertebrate praying mantis), or classic dragon-type fliers with 4 legs AND wings, etc. Agreed. The only flawed part of the science is the fact that the Na'vi only have 4 limbs. They should have 6 too as their 'lemur' cousins do. That you fail to recognize the two above facts give little credence to the rest of your argument. According to the supplemental books, the extra limbs are used to help gain traction and move more quickly through the denser atmosphere.